Introducing HyperPAC, the world's first Performance Automotive Computer, packed with FIVE distinct programs...Performance Tuning, Drag Strip, Dynamometer, Engine Monitor, and Diagnostics, with more exciting new software programs on the way. 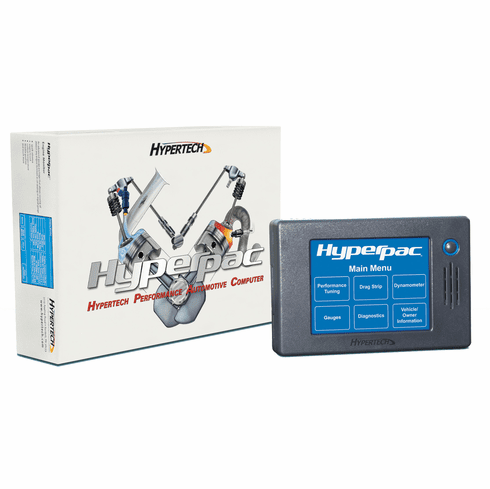 Based on years of dynamometer-developed engine tuning and track testing experience, Hypertech� designed the HyperPAC to be so easy to operate that no instruction book is really needed. Simply make a run and the HyperPAC automatically records, calculates, and displays the performance data that every enthusiast wants and needs to see. The touch screen shows only the buttons that apply to the current screen, eliminating cumbersome button combinations and multiple operations to navigate through programs. A "Smart Keyboard" or number pad screen appears automatically, only when needed to enter notes or other information. The user can select between a blue or white, high-resolution 3" X 4" touch screen that provides an easy-to-navigate, user-friendly interface. Just mount the HyperPAC in a convenient place, connect the cable to the vehicle's diagnostic port, press the "power on" button, and choose a program from the Main Menu. That's all there is to it! Drag Strip simulates a real drag strip. A "christmas tree" start produces an exact duplication of a drag strip time slip...reaction times, 60 ft., 330, 1/8th-mile, 1000 ft., and 1/4-mile speeds and e.t.'s. The HyperPAC also displays a "magazine-type road test," acceleration times in ten mile per hour increments, zero to 10, 20, 30...mph, 'til you take your foot out of it! All test sessions are automatically saved, for later comparison and review. Monitor real-time engine operating conditions before starting a run. Start tree simulates a real "christmas tree start". Automatically displays a time slip just like you get at the track. Displays "magazine-type road test" acceleration times in ten mile per hour increments. Displays drive wheel horsepower vs. vehicle speed after each run, in both table and graph formats. Records and displays important engine operating conditions throughout the run. Dynamomter calculates Horsepower and Torque, at both the driving wheels and the engine with results as, or more accurate than provided by expensive engine and chassis dyno testing. Dynamometer automatically displays, in both tables and graphs, corrected Horsepower and Torque vs. RPM at the engine and corrected Horsepower and Torque at the driving wheels. All dyno test sessions are automatically saved for later comparisons and review. Displays engine horsepower vs. RPM in both table and graph formats. Automatically corrects horsepower and torque to Standard Temperature and Pressure (S.T.P. ), allowing valid comparisons between tests conducted under different atmospheric conditions. Records and displays a data acquisition report of important engine operating conditions throughout the run. the RPM rev limiter. the transmission's shift points and shift firmness. the electric cooling fan on/off temperatures (for cooler thermostats). the speedometer and odometer to correct (as required by Federal Law) for non-stock tire sizes and/or gear ratios, and... the vehicle top speed limiter to match the speed rating of high performance tires. The HyperPAC allows a complete review of all performance selections on a single screen before reprogramming the vehicle, or to review currently programmed selections. Diagnostics gives the user the ability to read and clear Diagnostic Trouble Codes. It also provides an easy to understand description, written in plain language, so there is no need for shop manuals or service departments to explain it to you. HyperPAC's Engine Monitor Feature Continuously Displays Important Engine Operating Conditions! An advanced gauge package that allows viewing of almost any engine function as an analog or digital gauge, the Engine Monitor continuously displays important available engine operating conditions, like RPM, ignition knock, oil pressure, water temperature, and many more, user selectable from the menu. With the addtion of your choice of HyperPAC DA Modules, you can also monitor critical information like air/fuel ratio and exhaust fas temperatures. And while testing, or to diagnose a problem, touch "Start Recording" to record the event, and then touch "Stop Recording." All tests are automatically saved for later comparison and reveiw.